Comprising of prolific songwriter Jason Ingram, ex-Delirious? Electric guitar player Stu G, and Hillsong UNITED drummer Paul Mabury; the worship band One Sonic Society broke out in 2010 with their smash hit debut single “Forever Reign”, garnering critical and commercial acclaim from reviewers and listeners alike. Now 5 years and plenty of albums and EP’s later, the three friends are back with a new worship EP called Make A Way, releasing this week via Integrity Music. This release, in my opinion, is one like no other! Unique in the sense that most of these tracks have been recorded before by popular worship artists (however these are not covers as Jason Ingram has written all of these tracks as well! ), but now recorded in a different light, this 6 track experience has left me salivating for more and more of God’s presence. The longing and heart for Jesus is evident in the band, and Jason’s vocals in his delivery of fan favourites such as “How Can It Be” (recorded by Lauren Daigle), “Great Are You Lord” (recorded by All Sons And Daughters), and “Make A Way” (recorded by Desperation Band); has me sure of this modern worship band’s prolonged success in the years to come. 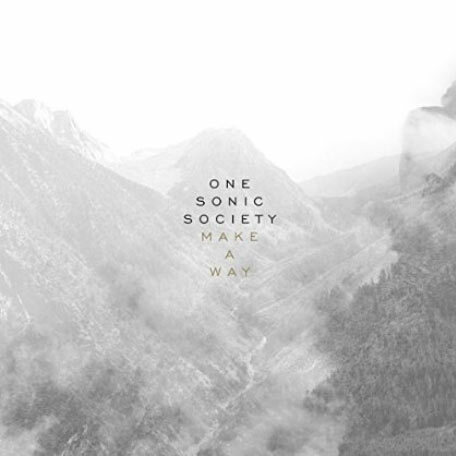 While this EP stands short at only 6 melodies, these inspiring and encouraging treasures are nevertheless honest and full of praise to Jesus- One Sonic Society have deftly crafted treasures out of dust, and this is certainly one of my favourite worship EP’s this year. Probably one of the most simple yet profound and Holy Spirit infused worship songs this year is the Lauren Daigle penned and recorded smash hit “How Can It Be”, and on this version, Jason and co sing this emphatic anthem quite brilliantly! Starting off with a more synth and electronic atmosphere, the passion and honesty is still there from the original recording, as Jason, Stu G and Paul express their gratitude and heart for Jesus, relaying that ‘…You plead my cause, You right my wrongs, You break my chains, You overcome, You gave your life, to give me mine, You say that I am free, how can it be…’. Though nothing could compare to Lauren’s soulful and r&b original version, this underrated relevant worship band have created a well thought out and executed version, which pays homage to Lauren’s version but also makes this song their own as well. Originally recorded by both Chris Tomlin (the live version) and Kristian Stanfill (the studio version), “Even So Come”, the emphatic electric guitar led and also synth driven 5 minute long epically awesome worship anthem introduces us to a heartfelt, urgent melody depicting that Jesus is coming soon. Giving us impetus so that we as Christians are on the lookout, and actively trying to spread the gospel to as many people as we can, Jason eloquently delivers the message with gusto and passion, bringing forth the theme that ‘…like a bride waiting for her groom we’ll be a church ready for You, every heart longing for our King…’. As we ardently sing God’s praises, the immersion in this soon to be great classic is evident, and Jason’s prowess as a worship leader and songwriter is further enhanced. While simple in its theme and lyrics, as Jason ardently and passionately reminds us of God’s greatness and faithfulness, it is the sheer emotion and evident heart for Jesus in All Sons And Daughters’ “Great Are You Lord” that really gets me excited. Though the anthemic and epic like piano led chorus is sonically sublime, it is the chorus that gives me chills as Jason highlights that ‘…It’s Your breath in our lungs, so we pour out our praise, we pour out our praise…’, creating an out of this world transparent and honest worship moment. Lead by the strings as well as a beautifully played keyboard, we are transfixed by the message of God’s greatness and sovereignty. Later on in the song big booming drums are introduced, yet the song still maintains its worshipful and intimate setting. “Make A Way” from Desperation Band is the last ‘cover’ and is probably the best song recorded on this EP! As Jason fervently and prayerfully reminds us that ‘…where this is no way, You make a way, where no one else can reach us, You find us…’; it’s a sobering and also comforting thought that Jesus will search for us and will find us every single time we try to run away from Him or find ourselves falling away; and I believe this necessary song is sure to strike a chord with many listeners who feel like they’re in the position of Jonah or the lost sheep in the Bible. A slow piano led ballad that builds to an epic and majestic like Holy Spirit led worship anthem; this is One Sonic Society at their peak vocally and worship leading-wise! The final two tracks on the mini-album are “I Just Want You” and “Can’t Stop Your Love”! Previously recorded by Worship Central and Ben Cantelon, what was originally a piano led melody is turned into a dance and synth led remix like melody, as Jason outlines that nothing we do or say isn’t going to influence the extent of God’s love for us, that ‘…whatever lies ahead, You’re with me ev’ry step, can’t stop Your love for me…it’s true with ev’ry breath, it’s true that even death can’t stop Your love for me…’. While the only original song on the album is the free worship almost spontaneous like guitar led melody “I Just Want You”, a simple and poignant melody outlining how much we want Jesus, and the fact that nothing else in this world can compare to the joy and love and peace found only in Him. Jason, Paul and Stu G. have crafted one of the most frank, transparent and fulfilling worship experiences this year as One Sonic Society, with emotional ballad songs both old and new alongside upbeat catchy toe tapping dance tunes! Some of my favourites have been recorded previously by other artists, but that doesn’t make these versions any less valid- this shows that familiarity works for the band. With their next album hopefully being a new full length studio album, which could be not far away, I encourage you to pick this album up at itunes if you haven’t already. With a smorgasboard of new melodies and long-time fan favourites; Make A Way EP will have you singing along- you’ll love this album if you love albums from Paul Baloche, Christy Nockels, and Passion!